Right then, without any further ado, it's on to part two of last week's reviews round up. 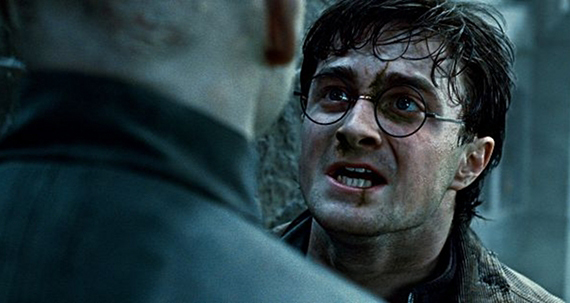 So, after a decade of incredibly successful films, the Harry Potter series has finally come to an end. I can't say that I've ever been a Potter superfan, but I've read the first few books and have seen all of the films in the cinema. In that time, ten years has passed - I've aged from a naive, spritely 19 year old into the decrepit, bitter 29 year old I am today. The Potter series has changed too, after the first couple of years in which we were (to quote Lazy Sunday) transported into a dreamworld of magic, the films have grown progressively darker as Harry, Hermione and Ron have faced up to the twin horrors of going through puberty and escaping their noseless nemesis. In this final instalment, matters finally come to a head, and young Harry has to face up to his responsibilities to face the evil Voldemort in battle, with the fate of the wizarding world on his shoulders... On the whole, I've enjoyed the Harry Potter movies, though I have to confess that I almost lost interest after part six in the series (Harry Potter and the Half Blood Prince), which was rather confusing for those of us who hadn't read the book. Still, I think both parts of The Deathly Hallows improve on that movie. Part One of the Deathly Hallows contains a few terrific early scenes (including my favourite scene, where the three protagonists dresss in disguise to infilitrate the Ministry of Magic), but the film seems to lose focus at about the halfway point, as Harry and pals go on an interminable camping trip as they seek out the 'horcruxes' which they must destroy before facing Voldemort. Part Two of the Deathly Hallows, in contrast, has very little slack. The opening scene (featuring John Hurt as an expert on wands) gently eases the viewer back into the swing of things, but after that the action is relentless, as our heroes stage a daring raid on Gringotts bank to retrieve one of the remaining horcruxes, then face off against Voldemort for the final battle. It's all very exciting stuff, though in all the confusion of the climatic battle scene, it's sometimes difficult to tell what's going on, and which of the supporting cast have died. I should also give praise to the cast of the movie - the Harry Potter series has always featured some of the best British actors in supporting roles, but Daniel Radcliffe, Emma Watson and Rupert Grint have really improved over the years, to the extent that they now appear completely natural and at ease on the big screen. Despite a slightly embarassing coda to the film (in which aging makeup appears to have been haphazardly applied to the young actors, meaning that some of them appear to have hardly aged at all, while others are wizened beyond their years), this is a fitting and very enjoyable end to the Harry Potter series. Mike Judge's comedy tells the tale of bored office drones working for a American software company at the turn of the century. Protagonist Peter Gibbons (Ron Livingston) lives a miserable existence, catering to the whims of his eight different bosses until an accident at the hypnotist's office enables him to finally relax and conquer the white collar world... Still a very funny movie, but perhaps not quite as great as I remembered, Office Space is at its best in the first half of the movie when it details Peter's awful life., but loses momentum in the latter stages where Peter and his friends are plotting to rip off their company. 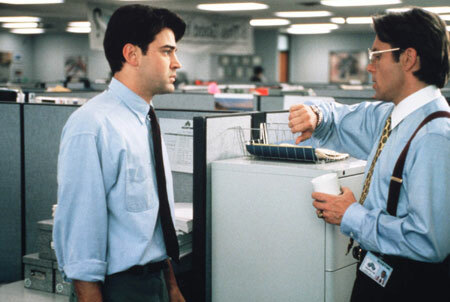 For me, the best thing about this movie is Gary Cole's performance as the loathsome boss, Bill Lumbergh - possibly the most punchable character ever to appear in a major motion picture.